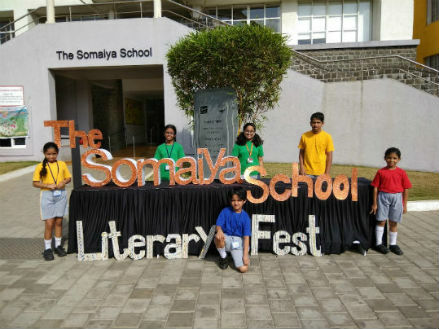 Mumbai: The Somaiya School organised a Literary week to encourage students understanding and love for literature, improve written and spoken expression and to inculcate the habit of reading in the students. To make the experience attractive and enjoyable for the new generation, a series of activities including literary games, quizzes, interactive sessions with professional book authors, a story telling session using puppetry skills were organised. Experts from various aspects of literature including Stand Up Comedy Show by Ms Kajol Srinivasan, an interactive session with Ms Heeru Bhojwani, an interaction with Author – Lubaina Bandukwala, a Harry Potter Workshop by Ms Anuradha Rohra. It was a week of flurry and excitement, with the children being fruitfully engaged and getting exposure to literature in different ways from the modern to the old masters. Parents too participated with great joy along with the students. “The literary week is genuinely epic in all ways. The games are superb, and our children learned so much while having fun. Highly appreciable are the teachers, staff, and students for taking the efforts. Workshops were truly exciting, and fun added Preeti Kukreja Mother of Nikhil Kukreja from the 7th grade. Author Deepa Balsaver said “ I think a Literary week is a wonderful concept. In an age when people are replacing the book with television, computer and smart phones. It was fantastic to set a habit of reading at an early age. Well done!! Overall, the Literary Week brought the students closer to the magic of language and literature.